'Trance' ( Bee Warburton, R. 1978) Sdlg. 72-4SB. JI (single), 30" (76 cm), Very late bloom. Standards violet-blue (RHS 92A); pearly violet stylearms with hooded crests; Falls pale violet with darker violet (90B) lines, giving overall effect of 91A/B, plicata markings on edge. Seed from Dr. Shuichi Hirao. Hirao seedling X 'Dazzling Debutante'. Warburton, Tranquil Lake 1979. From AIS Bulletin #281 April 1991: TRANCE (Warburton, R. 1979) JI, 3P, 30", VL. Standards violet blue (RHS 92A); pearly violet style arms with hooded crests; falls pale violet with darker violet (RHS 92B) lines. Hirao sdlg. X Dazzling Debutante. $30. Wild Mountain Thyme. From AIS Bulletin #293 April 1994: TRANCE-JAPANESE (3F). Warburton 1979, 30", L. Though introduced in 1979 this marvelous iris from Bee Warburton (her only JA introduction) has been relatively unavailable. 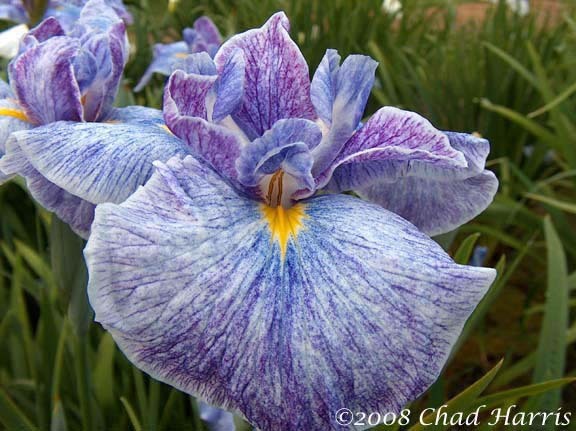 It made a triumphal reappearance at the 1990 Japanese Iris Convention where it was voted Favorite Garden Iris. We are pleased to offer it now. The pale blueviolet sanded falls are big and blousy with a crinkled texture. The perfect finishing touch is a cluster of darker blue-violet standards and hooded, upright stylecrests. Astrong grower with good bud count, it blooms over a long period. $15.00. Joe Pye Weed's Garden.